As we come to the close of the year, I wish to take this opportunity to thank you for your support that has enabled us realize several gains throughout the year. In order to promote an enabling legislative environment for sustainable solid waste management in Counties, we rolled out an initiative aimed at supporting 11 Counties (Mombasa, Nakuru, Kisumu, Uasin Gishu, Nyeri, Kisii, Meru, Kitui, Kajiado, Machakos and Kiambu) to develop solid waste management Policy and Bill. This follows successful collaboration with Nairobi City County to enact the Solid Waste Management Act. Engagements with the 11 Counties are at advanced stage and it is expected that the Policies and Bills will be in place in 2019 to address solid waste management challenges the Counties are facing. We also worked with Nairobi City County Government to finalize development of regulations for the Solid Waste Management Act to facilitate its effective implementation. At national level, Kara was appointed to be a member of the National Steering Committee on Development of the National Solid Waste Bill and Policy. The Multi-Stakeholder Committee is charged with the responsibility of facilitating development of a national law and Policy to govern sustainable management of solid waste in Kenya. As you may be aware, Section 12 of the Urban Areas and Cities Act requires that Urban Boards shall be established to manage service delivery in Cities and Municipalities. 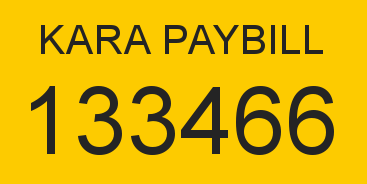 The Boards are expected to have representation of neighbourhood associations. Counties are at different levels of establishing the Board and we have so far received and responded to requests from 15 Counties to nominate neighbourhood associations’ representatives to be members of the Boards. The Boards will be key in managing provision of public services at the County level and we are actively engaging the Counties to ensure that competent individuals are appointed to represent the interests of Resident Associations and County residents in general. After successfully facilitating development of the Non Motorized Transport Policy for Nairobi County and advocating for its adoption at the County Assembly, our focus shifted to its implementation. We have had several engagements with the County Government and the development of implementation framework and action plan for the Policy is at an advance stage. We expect that a multi-stakeholder steering committee will be established to specifically drive the agenda of implementing the Policy. On matters security, we are encouraging members to embrace technology as a way of enhancing security within their neighbourhoods. In this regard, we have partnered with Safaricom to support installation of security surveillance CCTV cameras in various neighbourhoods. A pilot for this initiative was launched in Ngei Phase 2 Estate in collaboration with our members – Ngei Phase Two Langata Residents Association. Discussions are underway to roll out the initiative in other neighbourhoods. 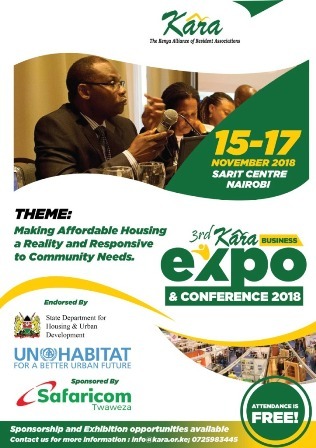 We successfully hosted the 3rd Kara Business Expo & Conference event under the theme: Making Affordable Housing a Reality and Responsive to Community Needs. The event provided a platform for our members to directly engage service providers both from the private and public sectors on service delivery issues. The Chief Guest at the opening ceremony of the event was Mr. Nzioka Waita, the Chief of Staff and Head of President’s Delivery Unit, who stated that the government is committed to work with Resident Associations towards achievement of the affordable housing agenda and other service delivery initiatives. The 2nd Annual Resident Associations Excellence Awards (ARAEA) ceremony was successfully hosted and presided over by Mr. Charles Mwaura, the Principal Secretary, State Department for Housing and Urban Development. ARAEA is designed to reward Resident Associations that have demonstrated exemplary performance in promoting sustainable development, access to better public services in Kenya and championing the interests of their members. 81 entries were received out of which 14 winners were identified and awarded. We congratulate the winners and look forward to making the award even bigger next year. As part of our engagement in the Government’s Big Four Agenda, we partnered with the Civil Society Urban Development Platform (CSUDP) to organize a series of Town Hall Forums in Uasin Gishu, Kitui, Kisumu and Kakamega Counties with a goal of initiating and facilitating dialogue at the County level on the role of citizens in the realization of the Big 4 Agenda. Similar forums will be organized in other Counties. Plans are underway to host Governor’s Roundtable Forums with key stakeholders at the Counties to facilitate structured engagement, information sharing and development of key priorities for the Counties in regard to the Big Four Agenda. In partnership with Hanns Seidel Foundation, we hosted a series of Bimonthly Talk Series (BTS) forums in various Counties to provide a platform for structured engagement on key service delivery issues between our members, partners and friends on one hand and the government, private sector, academia and development partners on the other. We appreciate those who were able to participate in the forums and commit to making them even more productive in the coming year. Finally we were honoured to be the recipient of the Town & County Excellence Award 2018. The award, given by the Town and County Planners Association of Kenya (TCPAK), was in recognition of our strong commitment towards advocating and supporting the improvement of neighborhoods in various towns and counties in Kenya which has contributed towards making better Towns, Counties and Country. We appreciate TCPAK for recognizing our efforts. We appreciate all our members, friends and partners who worked very closely with us during the year and contributed to the successes we recorded. We look forward to strengthening our collaboration with you and delivering even much better results in the coming years. I take this opportunity to wish you a Merry Christmas and a prosperous 2019. Thank you. Please note that the Kara secretariat offices will remain closed from Wednesday, 19th December 2018 and reopen on 4th January 2019. We will however have intermittent access to emails incase of any urgent matters that require our attention.